Memorial Day Weekend is over and we are back on the healthy eating train. We kind of pigged out this weekend. We ate red meat; deep-fried things; things made with boatloads of butter. We ate All The Things. So, I took an extra day off and with the goal of setting things to rights, I made this salad. I was inspired by a photo I saw posted on the internet of someone’s lunch at Los Angeles restaurant. I thought to myself: This salad is perfect. This salad is epic. It is so epic that it might just be The One Salad. 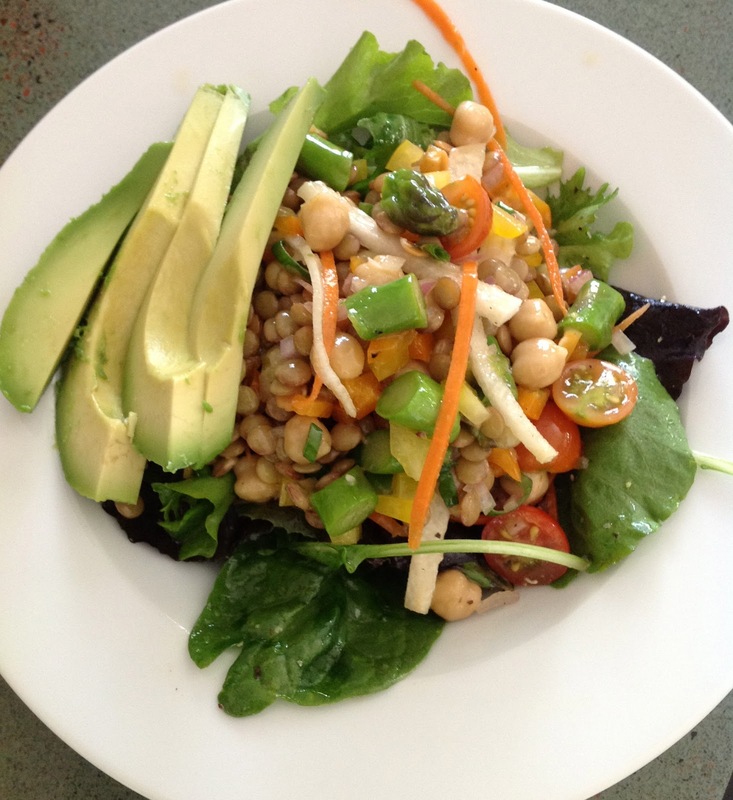 The salad that would undo the nutritional damage of a holiday weekend in one meal. Ok, maybe it didn’t do all that, but it certainly made us feel way more virtuous than where we were late Monday night. 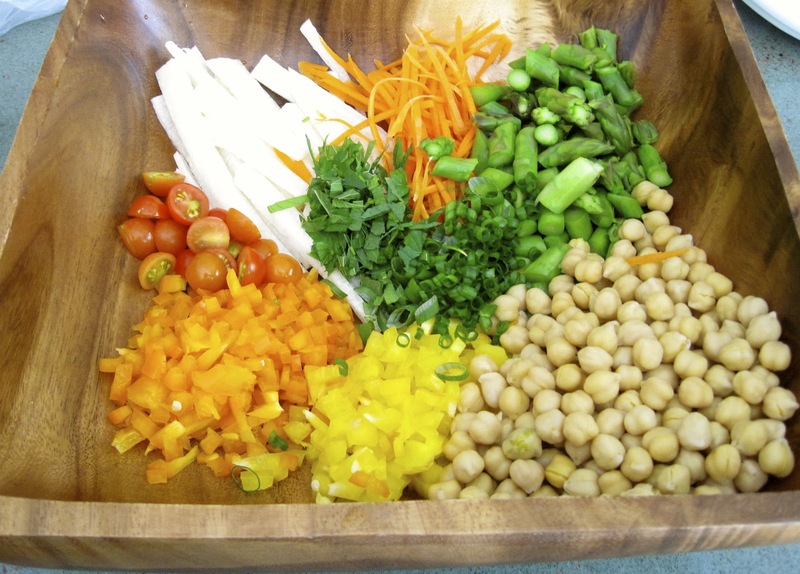 My salad contained lentils, chickpeas, asparagus, orange and yellow bell pepper, jicama, carrots and tomatoes, but the beauty of it is that you can use whatever vegetables you want! A few months ago I happened to catch an old favorite cooking show on PBS called “America’s Test Kitchen”. If you’ve never seen it and you’re interested in learning about the science of food and cooking, this is the show for you. It’s been on for quite a few years and while I don’t often sit down to watch it, when I do, I always end up learning something new. The episode I happened to watch demonstrated how to make perfectly cooked lentils–in other words, not soggy, mushy lentils. The host, Christopher Kimball explained that brining the lentils with salt and warm water allows the skin of the lentil to become pliable, so that when the lentil cooks and swells, the skin can expand and yet stay intact and the lentils won’t become mushy. Genius! I love science! 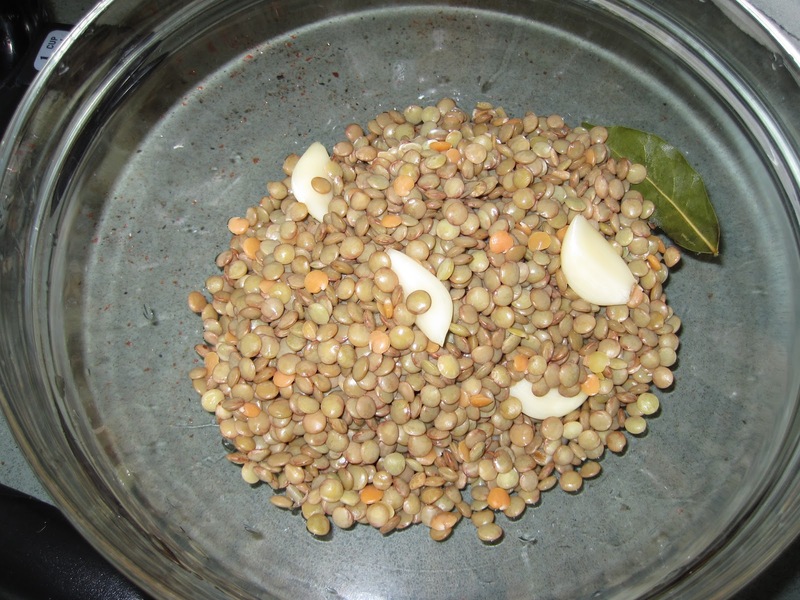 The lentils are cooked slowly in the oven so that the water doesn’t boil and further agitate the lentils. 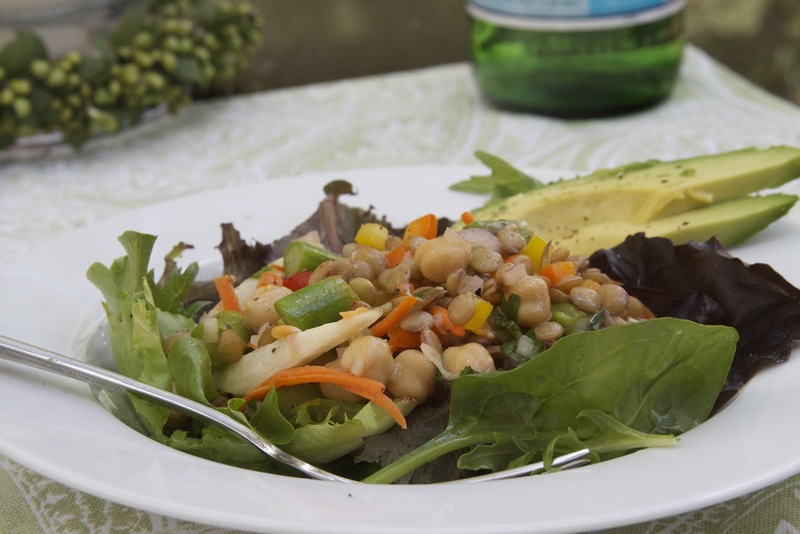 It takes a little extra time and planning, but it does result in perfectly cooked lentils that keep their shape and work perfectly in a salad. 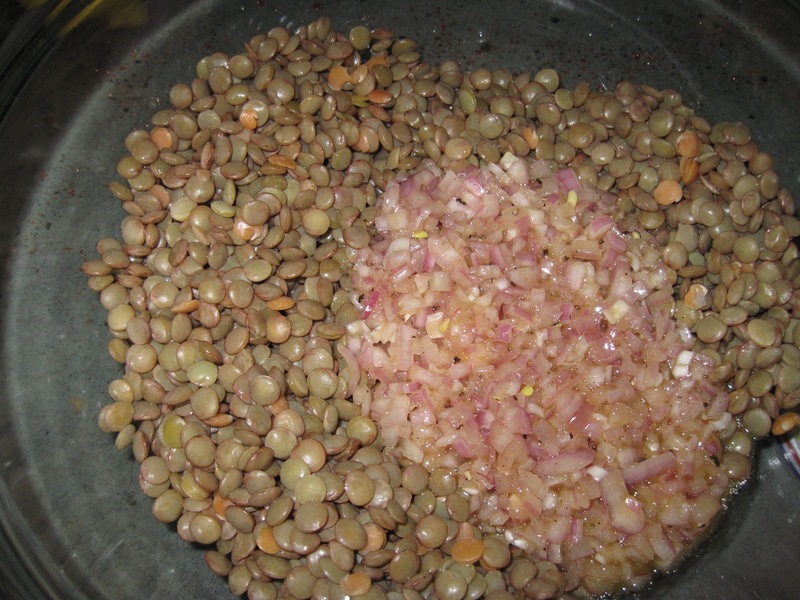 The lentils used in the episode were French green lentils, or Lentilles du Puy. Apparently, the technique works for every kind of lentil except for red or yellow lentils. The lentils from my grocery store are labeled simply: LENTILS. No fancy designation or anything, so I believe they are simply called “brown lentils”. They are a brownish, khaki color. Cook for 40 to 60 minutes until the lentils are tender. Drain and place into a mixing bowl. Remove the garlic and bay leaf. 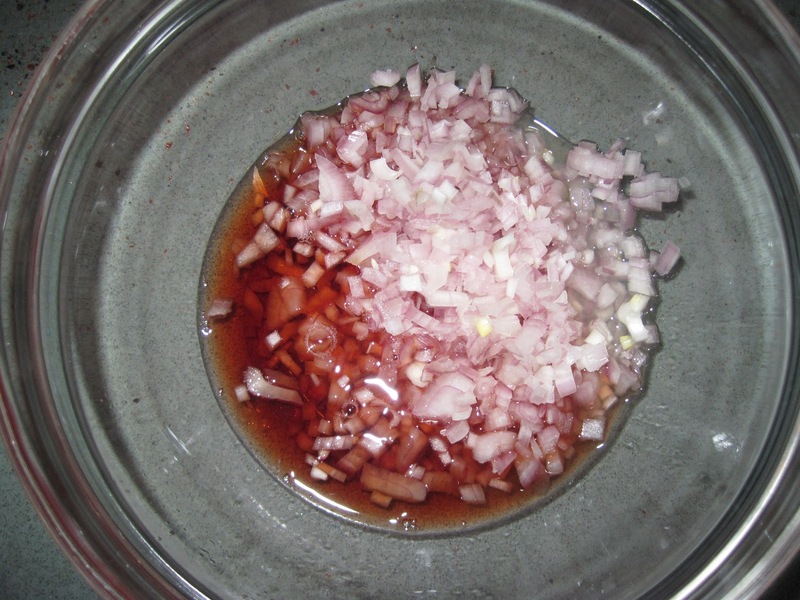 Combine the vinegar, lemon juice, shallot, dijon mustard and agave syrup or honey in a mixing bowl and whisk together well. Add the olive oil and continue to whisk until completely mixed. Season with salt and pepper then stir the dressing into the lentils while they are still warm so that the lentils soak up all that good flavor. 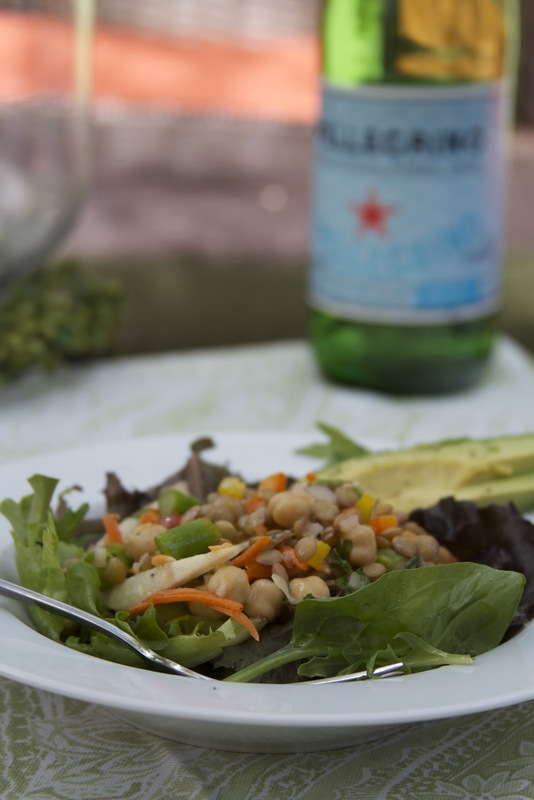 Now combine the lentils with the vegetables and mix well to incorporate the vinaigrette. Season to taste with a little salt, pepper and a squeeze of lemon juice, if desired. I always desire a squeeze of lemon juice! Lightly dress your salad greens with olive oil first, then some freshly squeezed lemon and a sprinkling of salt. I always dress my salad greens, because eating dry lettuce just makes me sad. Top with a generous helping of the lentil/vegetable mixture and enjoy! I garnished mine with some sliced avocado.